Organic Soup with Bone Broth is a HIT! 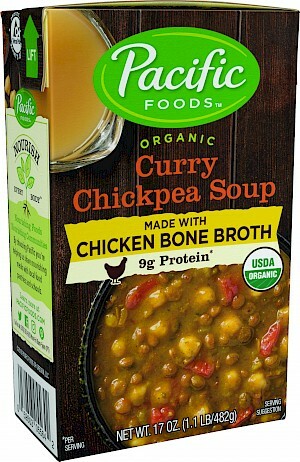 Bone broth has been hot, but Pacific has brought it to a new level with a line of soups made with bone broth. This one is fabulous loaded with vegetables and legumes. The curry flavor is just right . One cup, about half the container, is 170 calories, 3 grams of fat, 480 mg of sodium, which I would like to see lowered, 5 grams of naturally occurring sugars and a whopping 9 grams of protein. Well done!